One of the things I love most about running outside is seeing all of the different elements of nature. I also love meandering through different neighborhoods as the seasons change and enjoying the decorations that people put up for the changing holidays. One item that seems to remain year round are the flags. There are many American flags and some flags indicating the homeowners’ nationality along with seasonal flags, etc. 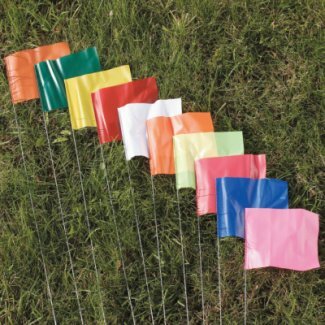 I have noticed that the flag I see most often are the little “keep pets and children off the grass” flags that are stuck into the lawn. These, of course, indicate to us that a harmful pesticide has been applied to the lawn and if we are smart, we as adults will stay off the lawn as well. Then there are the red and yellow flags that inform us that cable wires and gas lines lie beneath the surface. Those flags keep us from digging where we should not. When I see these little banners, I often am reminded that we are so blessed to have the Holy Spirit to warn us of any spiritual red flags that pop up in our territory. 16 Do you not know that you[a] are God’s temple and that God’s Spirit dwells in you? 14 For all who are led by the Spirit of God are sons[a] of God. These spiritual red flags are also designed for our benefit to keep us from digging where we have no business or stepping into a territory that many be poisonous to our spirits. There are many different kinds of “flags” we should be allowing the Holy Spirit post in our lives. Some of those flags come when a concept introduced to us would compromise the pure word of God. A good example could be a new age or occult practice or adding spiritual practices from other religions into Christianity (and calling it holy.) Most of these things started out with some sort of a biblical truth but usually get mixed with idolatry. Often these practices take the focus off of God and put the worship on selves, animals, nature, or small g gods (who are still dead). A lot of these practices seem like they could be beneficial, but if the flag is ignored, most likely there will be some sort of consequences. Just like that little flag on the lawn, we need to be very sensitive to our God-given flags (our conscience) and the unsettled feeling and warning that the Holy Spirit extends to us. All of the chemicals applied to our lawns eventually sink deep down into the ground and create a controlled environment where only certain things can grow. As we mix strange fire with our Christianity, it becomes easier to ignore the flags until one day we find ourselves with unholy practices that have rooted themselves deeply into our lives. This is another reason why we need to know and understand God’s word. There is so much spiritual information available to us today, that we must allow ourselves to be aware of the red flags coming up in our spirits. If something seems even a little off to you, it probably is. God’s word doesn’t change. You can measure any newly introduced belief or practice against His word. If we have to ask others where something is found in the bible, we are not doing our homework. Look it up for yourself and allow the Lord to teach you. 27 But you have received the Holy Spirit,[a] and he lives within you, so you don’t need anyone to teach you what is true. For the Spirit[b] teaches you everything you need to know, and what he teaches is true—it is not a lie. So just as he has taught you, remain in fellowship with Christ. One of my favorite topic research tools is http://www.biblegateway.com. I encourage you to check it out. What other tools have you found on the internet to help you in your spiritual walk? I would love to hear from you.